If you are in the market for an affordable sedan from Germany, the 2017 Volkswagen Passat might be just what you are looking for. Inside you will find one of the roomiest back seats in its class along with a nice quiet ride, and plenty of acceleration from the turbocharged four-cylinder engine hiding under the hood. New for this year is the demise of the SEL trim (the SEL Premium is still around) and a few changes in how the options and standard features are spread out among the various trim levels. 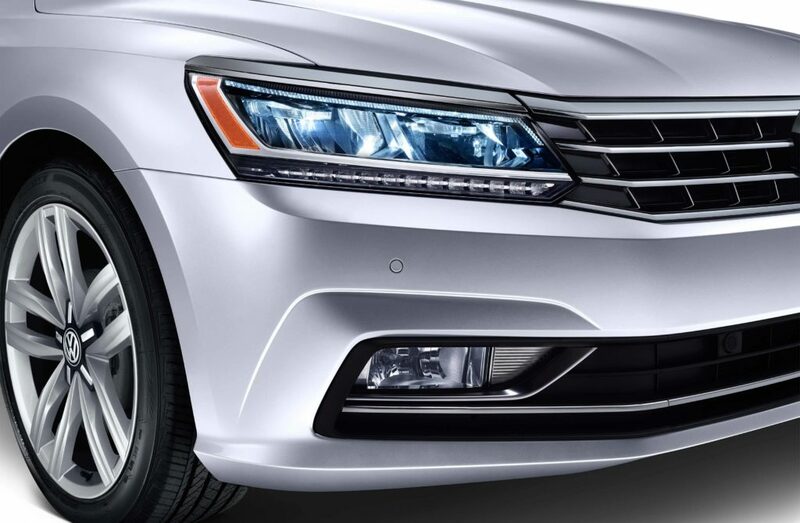 All VW Passat models are front-wheel drive and are available with your choice of four-cylinder or V6 engine. The 1.8-liter turbocharged inline four-cylinder engine is rated at 170 horsepower and pumps out 184 pound-feet of torque. This engine is mated to a six-speed automatic transmission. This combination manages zero to sixty miles per hour in just 7.7 seconds. EPA fuel economy ratings show this Jetta gets 27 miles per gallon combined or 23 city/34 highway mpg. If you want more power, the SE and SEL Premium trim come with 3.6-liter V6 that offers 280 horsepower and a very healthy 258 pound-feet of torque. This one comes with the VW DSG six-speed dual-clutch automatic. It manages the zero to sixty miles per hour sprint in only 6.4 seconds, exceptional for cars in this class. EPA fuel economy ratings for this version of the VW Jetta are 23 mpg combined or 20 city/28 highway mpg. Classy yet refined is the perfect way to describe the interior of the 2017 Jetta. Top quality materials are used throughout the cabin. Seats feature solid bolstering and are well-padded, making them equally comfortable for short trips around town and long road trips. The base model comes with a 5-inch infotainment touchscreen while the upper trim levels receive the upgraded 6.3-inch touchscreen. As you might expect the on-screen menus, buttons, and controls have all been intuitively designed and are easy to use. Among the upgrade features found in the SE trim are keyless entry and ignition, a sunroof, rear air vents, adaptive cruise control and the optional SE Technology Package. This package brings a hands-free trunk opener, eight speakers, a navigation system, heated rear seats, remote start, and more to the table. Those who opt for the SEL Premium will get power folding mirrors, a power front-passenger seat, a premium audio system from Fender, driver memory functions, a special ski pass-through in the rear seats, and automated parallel parking. All trim levels come with a rearview camera, antilock brakes, and a forward collision warning system complete with automatic emergency braking. You can add in the optional lane departure warning, blind-spot monitoring, and rear cross-traffic alert systems. Whether you decide on the base model of the top-of-the-line SEL Premium, the 2017 Volkswagen Passat has a lot to offer. The four-cylinder version offers quick acceleration with great fuel economy, the V6 offers improved performance with only a slight decrease in economy. No matter which one you choose, we invite you to come out to Durham VW to take one or more of these amazing mid-sized sedans out for a test drive. Call us at (919) 493-7411 to schedule your appointment today or come on in and find out why so many of your friends are driving the Volkswagen Passat.